MSRP: $82 to $152, for my iMac, your mileage may vary. It has been said that, “One cannot be too thin, too rich, or have too much RAM.” Those who know me understand that I have nothing to worry about the too thin or too rich part of that statement. However Crucial has given me the opportunity to explore the third part of that equation. My desktop Mac is a 2014 Retina iMac, running macOS Sierra with 24GB of RAM in banks of 8 and 16. The provided 16GB of Crucial RAM will allow me to bring my computer up to the machine maximum of 32. The memory was delivered in a secure, anti-static and easy to open package. Installation was a breeze, taking about five minutes. There are several on-line guides to help the first time installer. If you have concerns about your abilities, seek the help of a qualified technician. 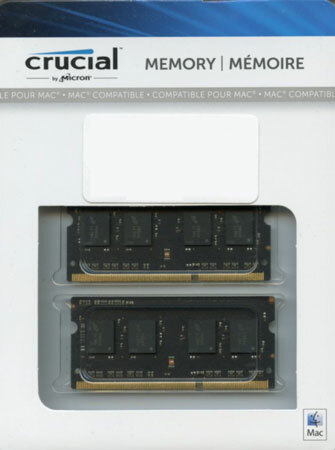 It is important to purchase your memory from a reputable source that offers a lifetime warranty such as Crucial. Please do not be seduced by what appears to be a bargain price at Joe’s Incredible RAM located at the corner of Cheap and Crummy. That kind of bargain, isn’t. There are different ways to measure the effectiveness of a RAM upgrade. One objective way is to measure performance with a software tool called Geekbench. I ran Geekbench on my iMac with all of the RAM configurations that I had available — 8, 16, 24, and 32GB. 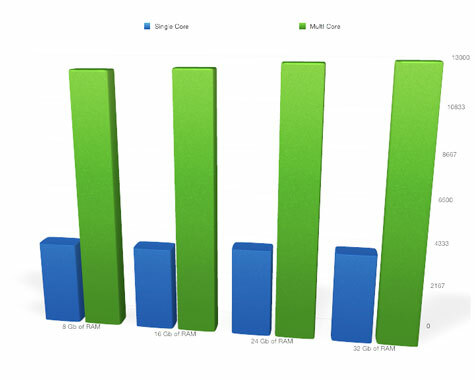 There was a measurable increase in performance with each increase in RAM. It was surprisingly little; see my chart below. This objective view does not tell the whole story. An objective way to measure your RAM requirements is to open Activity Monitor*, included with your macOS, set it to Memory and go about your daily business. Periodically go back to Activity Monitor and check the memory used reading. I have found that I can climb the hill to the 16GB plateau without even breathing hard. I am confident that launching more applications and then opening multiple documents in each would have me leaving the 16GB level far behind. Prior experience tells me that each upgrade of macOS and applications will bring new features along with the cost of a larger memory footprint. I agree that you cannot have too much RAM. My recommendation is to have 16GB as a minimum. Crucial is a good, reputable purveyor of this important component for your Mac. You cannot go wrong by trusting Crucial. *Activity Monitor can be found in the Utilities folder inside the Applications folder.